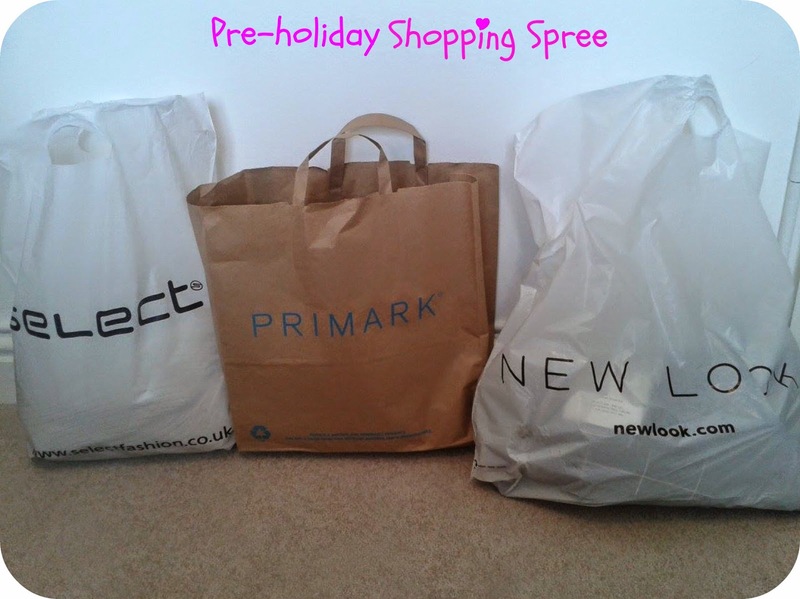 Jade's Lifestyle Blog ♥: Pre-holiday Shopping Spree! Primark was first up! 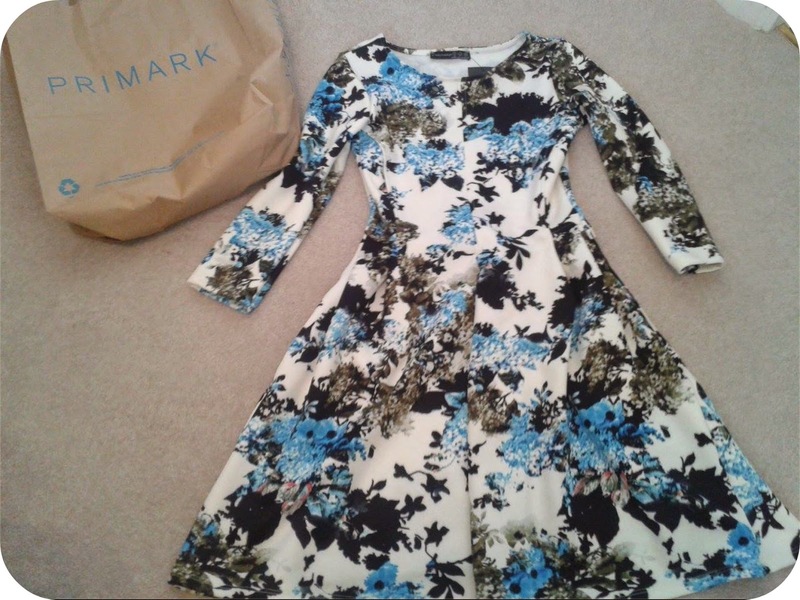 I had a bit of a browse before falling in love with this dress! The picture doesn't really do it much justice, I had to get a small size because with dresses and jumpers in particular, they usually swamp me. But I assure you, in real life it looked great on and off! It is the Atmosphere ivory print scuba skater dress and it costed me £13.99. Oh Primark how I love your prices. The patterns and colouring are fantastic and it is SO figure hugging, one of my favourite dress purchases of recent times. Next was Select, another shop with very affordable prices (yes, this pattern has already emerged). 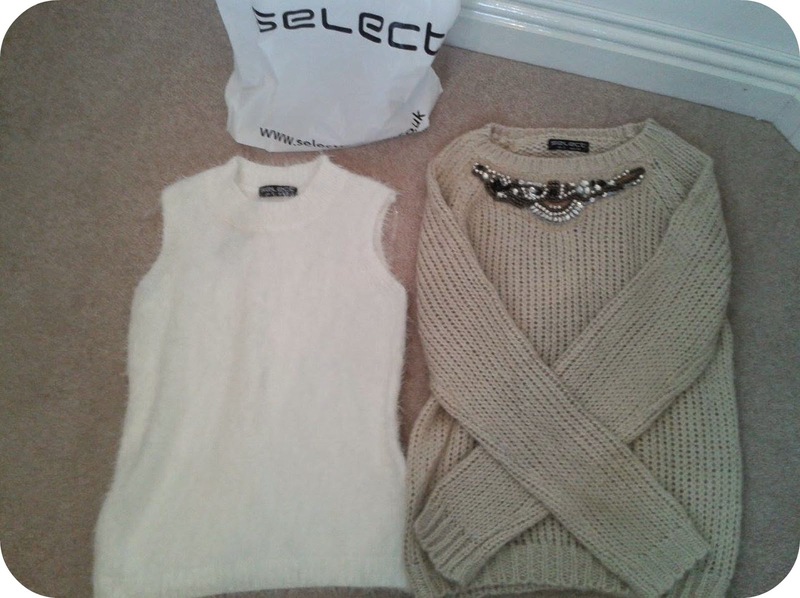 Firstly, I spotted the white sleeveless eyelash jumper for £11.99 and fell in love! Even if more of a winter colour, I'm really into fluffy white clothing at the moment after purchasing a Mickey Mouse jumper a couple of months ago. It's SO comfortable and warm, and I liked the fact that it was sleeveless - meaning that with the unpredictable weather right now, who knows if it'll be hot or cold - I have no sleeves for the former, or a thick material if the latter case. I was also DELIGHTED to find the Stone baroque embellished jumper for £14.99! I'd been dying to find a jumper this colour and this was the best one I came across in the store! Once again so comfortable, and also meaning I can ditch a necklace when wearing, due to the statement array of beads and sequins sewed on the front, gorgeous! Lastly was a trip to old faithful New Look! Originally I'd spotted a t-shirt I'd wanted (a black version of a pink collar sleeveless shirt that I already own) but annoyingly it wasn't in my size! Oh well, I still managed to find a couple of other things to wear for night-time on holiday! 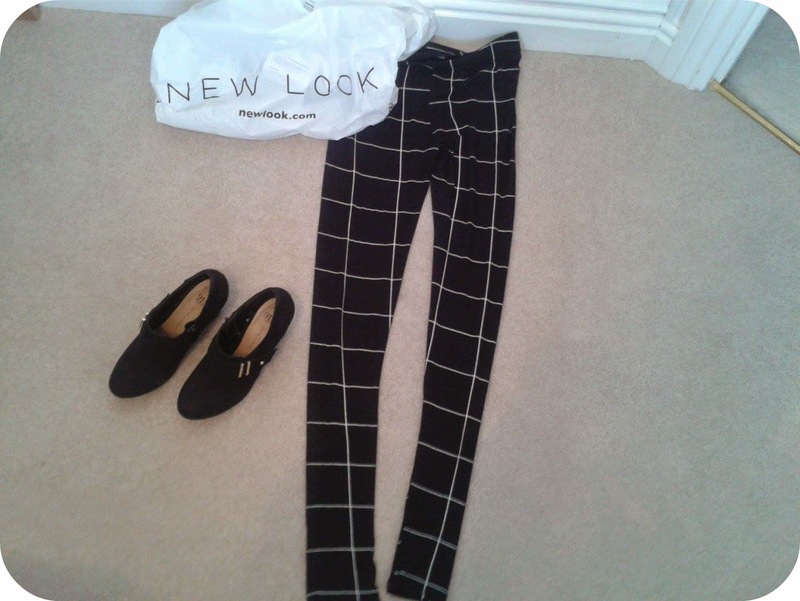 First up I found the black grid check leggings for £12.99. Leggings is a department in my wardrobe that is pretty lacklustre, and due to an obsession with monochrome, these minimalistic but lovely leggings were the ones I ended up with! I also knew that I definitely needed a new pair of shoes. It was a tricky task though, particularly being surrounded by scarily high heels that would be laughable if I even attempted to walk in them. 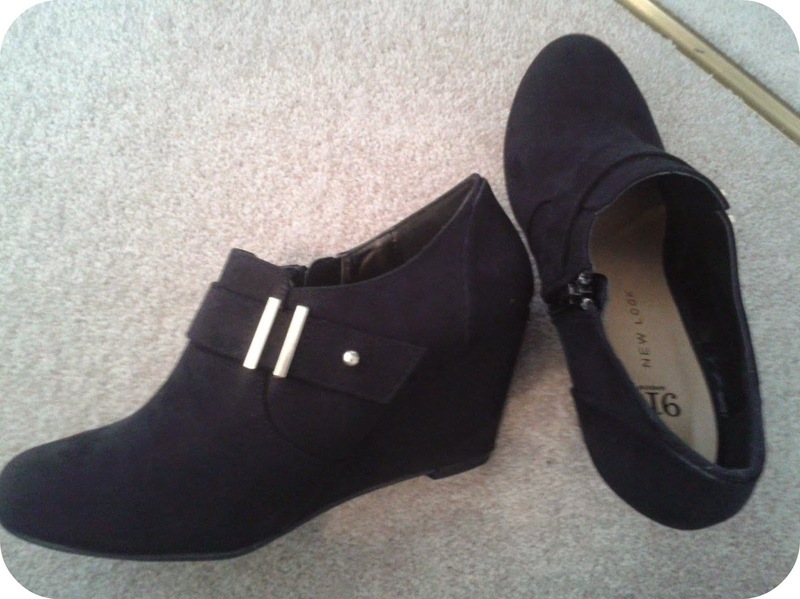 So I eventually settled on these - Teens Black Metal Trim Strap Wedge Shoe Boots for just £19.99! Wedges are just IDEAL for someone like me who needs a bit of height but isn't the biggest fan of skyscraper heels. These ones are quite comfortable and I adore the design. So, that's all this time! I cannot wait for the pure escapism and joy of holiday (although it does mean missing a Halloween house party - why must plans always clash!) and now I have a few more items to take with me to Spain. I will so be making the most of their culture donning New Look clothing and eating at McDonalds... oops. But yeah so so excited! Hope you guys enjoyed this, any recent clothing purchases of your own? 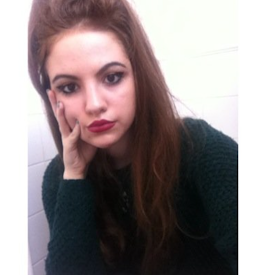 or any of mine that you're quite liking? Thank you for reading as always! p.s. no blog post this week due to being in Spain so will do two within the two days I get back if that is okay! Lovely dress and boots! And the prices are extremely reasonable! 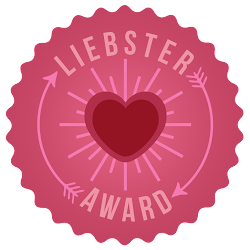 Aw thank you, lovely! Exactly, it's incredible the prices when stores like Topshop or River Island pay almost double for one item than two combined! Thank you lovely, can't wait to wear them out!! Aw, thank you Danielle! It's one of those rare cases where it actually looks BETTER on, so figure hugging! I'm in love with clouthes from SELECT shop :) they are perfect! I know right? They have such lovely stuff in there, literally took me about two minutes to find something I liked!! Ooh thank you lovely, will check that out right now!